Efficiency is vital when running a retail banking institution. If your team can work faster and more productively, then your organisation can run more effectively. Computers have an undeniable impact on productivity, and since almost everything in business is run on computers, it is important to maximise the tools your team uses to perform. Slow computers can drain time and patience, resulting in increased frustration and a loss in productivity. As the digital age is upon us and technology moves fast, we expect our computers to keep up. When faced with a slow computer, most people feel the need to purchase a new system to get the speed back, but this is unnecessary. Instead of spending hundreds on a new computer or a software gimmick, you can extend the life of your businesses computers and speed them up simply by installing more memory and a solid state drive (SSD). An SSD functionally does everything your hard drive does, however it does not have a mechanical arm. This significantly increases the speed of the drive and decreases their failure rate.By installing SSDs into your business’ computers, you will notice an increase in productivity and efficiency. On average, SSDs are able to complete everyday business 6x faster than hard drives. [i] Since most retail banking employees perform some combination of the below tasks, SSDs can help enhance productivity for institutions of all sizes. (in seconds) How much faster is an SSD? It is evident that a new SSD drive can significant impact your team’s productivity and efficiency. However, if you’re like most IT departments, your budget probably isn’t keeping up with the explosive demands of an increasingly digital world. This makes maximising your budget essential. Consequently, the most cost-effective approach to this is to upgrade the existing memory and storage.It might seem tempting to replace old computers or take them to a repair shop, but this is often costly and largely unnecessary. In fact, new research found that upgrading an older system with more memory and an SSD costs 75% less than buying a new system.ii By installing your own system, you can eliminate the labour costs and save time. 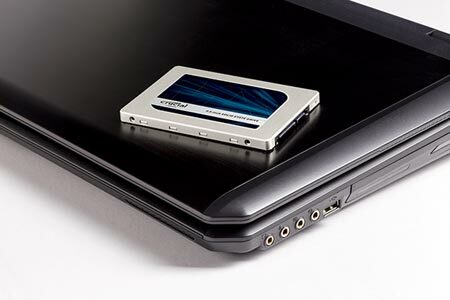 SSDs change the pace of business – and your bank’s productive potential. By installing your own memory and SSDs you are enabling your team to work faster and more productively. Wait times can often seem inconsequential when it’s just one person or one department. But when your entire organisation is suffering under the strain of slow technology, the weight is crushing. So if you want to increase efficiency and generate productivity in your organisation then maximise your existing infrastructure. You don’t need new systems to run new software – just better components.